1. After you stopped screaming, what did you get out of the trunk of Little Blue? I have no idea what you were getting out of the car! Probably something to stuff down your throat to muffle the screams! I am looking forward to reading your answer on this question. 2. In the photo above, what is all the black stuff on the ground? 3. Were your sandals appropriate footwear for hiking on a volcano? Yes, but what about your hair? 4. What is the significance of your stance in the photo above? 5. How many time zones are there? 6. 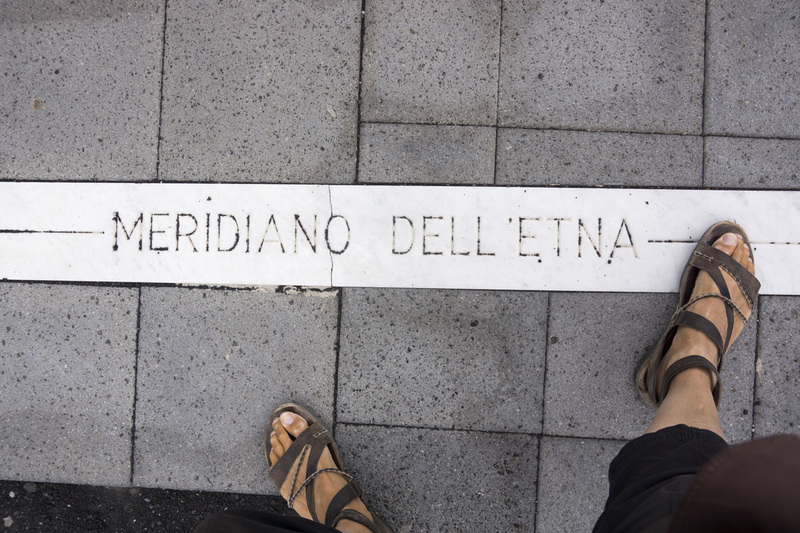 What is the name of the meridian line you are stradling? 7. Who has the worse hair-do? 8. Where are you? (Select all that apply). 9. Although it wasn't planned this way, why did it end up that your clothing choices for the day were appropriate (well, except for the sandals)? Because the air was cold with the wind but the earth was warm from the lava. 12. Volcanic activity first took place at Etna about ____________ years ago, with eruptions occurring beneath the sea off the ancient coastline of Sicily.